It's durian season again. Durian is the King of Fruits. It seems that Kijal, Trengganu is also famous for its durian apart from it's Lemang. Bad luck for me that Mama is crazy about durian. Last season she didn't get to wallop durian coz I was in her tummy. 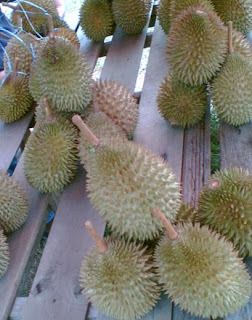 This round, Mama saw durian sold along the road in Kijal and Papa said Kijal durian taste good. Needless to say, we stopped and "borong" some. Quite cheap. One "longgok like this cost RM25 only. Worth it as the durian taste good. Mama loves durian that taste bitter. 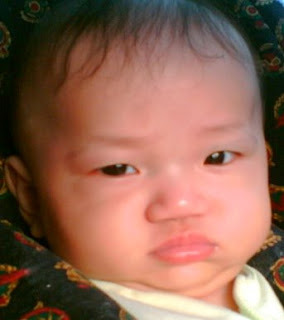 Hmm...good news for Mama but bad news for me who is too young to eat durian according to Grandmama. I have to bear with the "stinky durian" for the rest of the journey to K.T.